Nick Mauss, nervous system, 2014, powder-coated steel, acrylic, 65 × 86". Nick Mauss’s work embodies drawingwhich may come as a surprise, considering that, at first glance, his latest exhibition consisted of six cut powdered-coated-steel sculptures, four plaster wall pieces, and one work in aluminum leaf. That is, the activity of drawing seems less prominent in these works than the things themselves as constructed material objects. 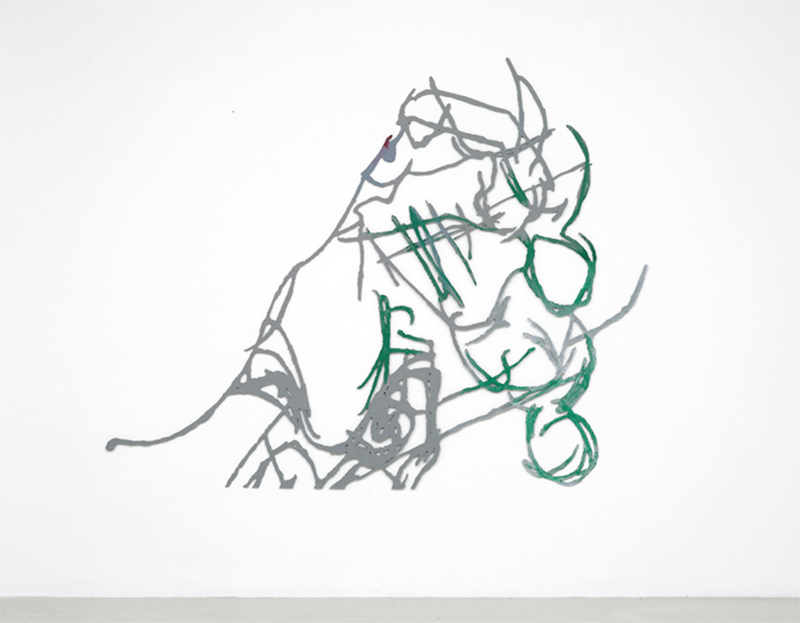 For example, place of blurring, 2014, is drawn and painted on a rectangle of plaster held by wire mesh in a wooden frame, while nervous system, 2014, is a linear wall relief made out of cut steel covered with patches of green acrylic paint. Order the PRINT EDITION of the March 2015 issue for $17 or the ONLINE EDITION for $5.99.